The strength and experience of GENERON‘s Sales & Engineering Team within the Oil & Gas global markets is now invested its focus into the Mexican Market; introducing custom designed nitrogen packages for offshore applications. GENERON recently shipped another Nitrogen Generator Package to Mexico to be used on the PEMEX Offshore Platform CB-LITORAL-A which is been awarded by Dragados Offshore Mexico S.A de C.V. The Nitrogen Generator included a Nitrogen Storage Tank to safeguard the delivery pressure. 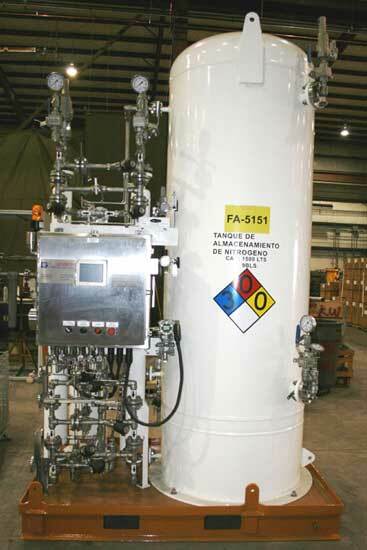 This system will be used for Blanketing and Inerting applications and was built to Class 1 Div 2 Group C, D. In Addition, GENERON worked closely with PEMEX to ensure the nitrogen system was designed and built according to PEMEX specifications.